The Zimbabwe Security Forces and unidentified gunmen have intensified a crackdown on supporters of the opposition Movement for Democratic Change Alliance (MDCA) in the aftermath of August 1, 2018 post-election protests in Harare, Human Rights Watch said. The police, soldiers, and unidentified armed men also beat up and harassed scores of people in Harare over the last few days as they searched for opposition party officials. "With soldiers unleashing violence against ruling party opponents, the veneer of respect for human rights and democratic rule that President Emmerson Mnangagwa claimed is now clearly gone," said Dewa Mavhinga, Southern Africa director at Human Rights Watch. "His administration needs to act quickly to restore its integrity and commitment to the rule of law." Human Rights Watch documented numerous cases of beatings and harassment by soldiers in several of Harare's high-density suburbs, including Chitungwiza, Seke, Dzivarasekwa, Glen Norah, Glen View, Kuwadzana, and Highfields. The soldiers, in groups of 4 to 10, beat up people in bars and restaurants, accusing them of letting down Mnangagwa because the MDC Alliance candidate, Nelson Chamisa, won the majority of votes in Harare. A man in Chitungwiza told Human Rights Watch that the soldier who beat him said he was punishing him for voting for the wrong candidate. Another victim, an elderly woman who was assaulted by three unidentified armed men with masks in Highfields, said, "Why does the government ask us to vote freely when elections bring violence and death?" At around 2 a.m. on August 5, six masked men broke into the house of MDC Alliance Youth Chair, Happymore Chidziva. A woman in the house told Human Rights Watch that when she screamed for help, one of the men pointed a rifle at her head and told her to be quiet or risk death. One of the men slapped and kicked her. The attackers also beat up members of three other families in the house, then abducted two of the men. The masked men put the abducted men in a white double-cab truck and drove them to a secluded place along Masvingo road, then beat and kicked them for an hour before releasing them. Four armed men also stormed the house of Mirriam Mushayi, an MDCA parliament member, in Kuwadzana at midnight on August 5 looking for her, but she was already in hiding. Witnesses told Human Rights Watch that the men allegedly had a list of five MDCA officials they were looking for. Human Rights Watch also spoke with witnesses who said they saw groups of ZANU-PF supporters in Muzarabani South, Chivhu, and Marondera go to houses of known MDCA supporters and election officials, singing war songs and threatening retribution to all opposition activists. Zimbabwe Lawyers for Human Rights, a local rights group, reported that 28 people arrested by police appeared in court in Harare on August 6, facing charges of public violence. The Zimbabwe Defense Forces spokesperson, Overson Mugwisi, denied that any soldiers were involved in the alleged harassment, and has taken no action against any security forces for the attacks. 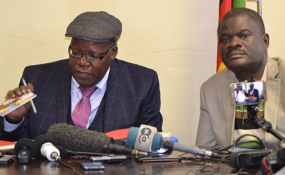 "The authorities should immediately halt the abuses by police, soldiers and their armed allies that are causing the human rights situation in Zimbabwe to deteriorate rapidly," Mavhinga said. "They should ensure security for all and open credible investigations to hold those responsible for the attacks to account."